Where do I manage and edit member permissions? How to change a user role and access to apps, projects and layers. As an administrator of an account, you may want to define custom permissions and levels of access to specific apps, projects, and layers. 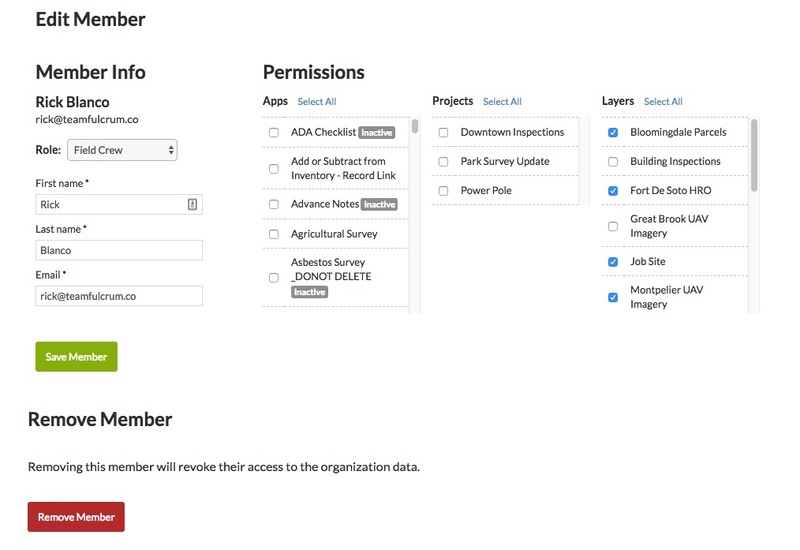 There are two general ways that you can edit member permissions. One is through the member permissions page. The other is from within the app, layer, or project pages. 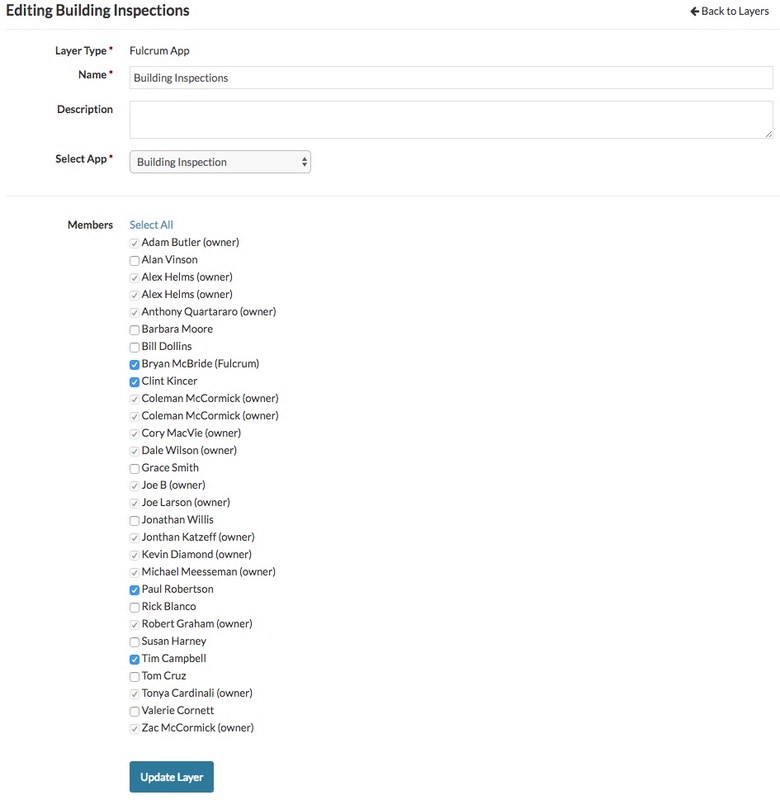 To edit or modify a member’s role, remove someone from the account, or permissions for apps, layers, or projects you will want to start by clicking on the Settings option from the configuration drop down menu (red gear). Then select the Members tab. Then locate the member you would like to edit the permissions for and select Edit to the right. After clicking the edit button for a member, you are taken the to that member's permission page. From the member permissions screen, the user's role can be changed. Member's access to apps (and the data within those apps) can be granted or revoked, they can be assigned to projects or given access to your offline layers. At the bottom of the page, you will find the option to remove the member from your plan. 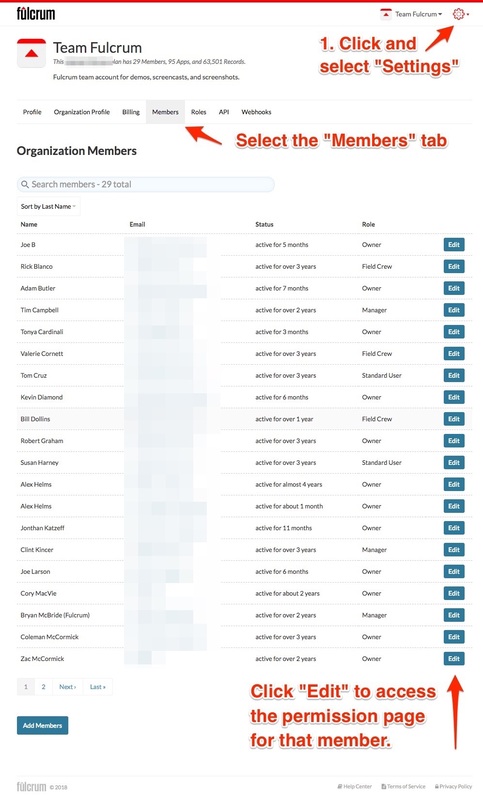 You will only be able to edit a member's email address if their user account is only associated with your Fulcrum plan. Any users with “Owner” role in your plan will automatically have access to all apps, layers, and projects within the plan. The ability to edit the access to apps, layers, and projects can also be managed from within the element itself. This is useful if you need to grant/remove a group of members access to a specific app, layer or project. On the app's dashboard page, you can manage what users have access to the app from the members tab. On the layers management page (where you go to add a new layer), you can select to edit a layer and then edit which users have access to that layer. 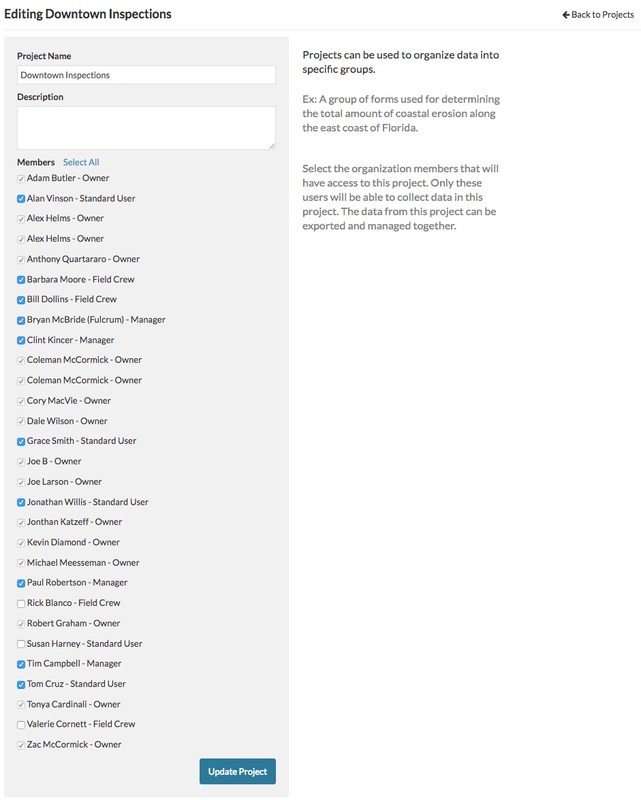 On the projects management page (where you go to create or edit projects), you can edit a project and and then edit which users have access to that project.